The crewmembers received DFCs for their participation in mission #44, the May 25 mission to Tokyo. 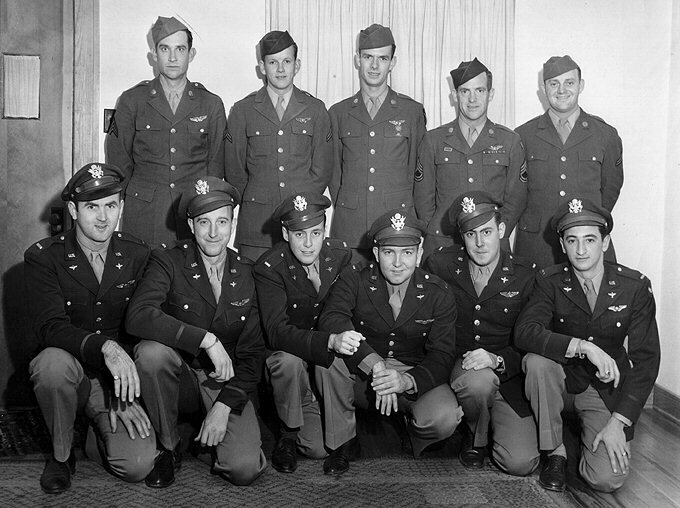 Standing - Left to Right: S/Sgt Roy "Swampy" Johnson (Tail Gunner), S/Sgt Kenneth E. Jenkins (Left Gunner), Sgt Albert W. Carroll (Right Gunner), T/Sgt Cecil E. Newkirk (CFC Gunner), S/Sgt J. C. "Flip" Gober Jr. (Radio Operator). Kneeling - Left to Right: 1/Lt Richard F. Cooney (A/C Commander), 1/Lt Arnold W. "Slim" Meyer (Pilot), 1/Lt Frederick R. Bohl (Engineer), 1/Lt Harvey H. Egner (Navigator), 1/Lt Edward T. Peltzer (Bombardier), 1/Lt Harold G. "Hal" Harner (Radarman). 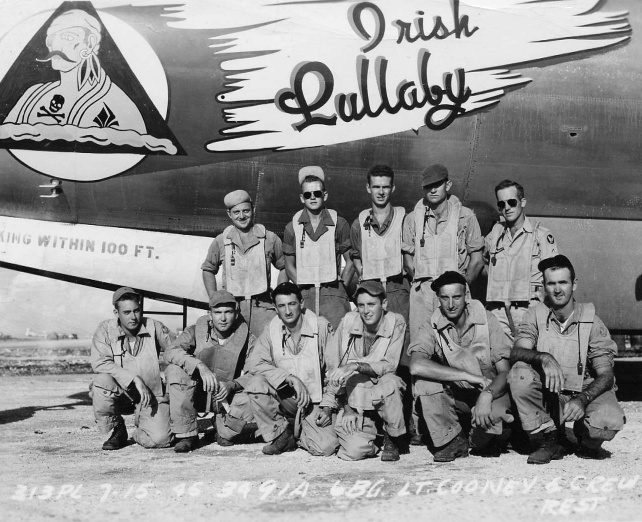 Crew #2419, the crew of "Irish Lullaby"
Standing - Left to Right: S/Sgt J. C. "Flip" Gober Jr. (Radio), S/Sgt Kenneth E. Jenkins (Left Gunner), Sgt Albert W. Carroll (Right Gunner), S/Sgt Roy "Swampy" Johnson (Tail Gunner), T/Sgt Cecil E. Newkirk (CFC Gunner). Kneeling - Left to Right: 1/Lt Edward T. Peltzer (Bombardier), 1/Lt Harvey H. Egner (Navigator), 1/Lt Harold G. "Hal" Harner (Radarman), 1/Lt Frederick R. Bohl (Engineer), 1/Lt Arnold W. "Slim" Meyer (Pilot), 1/Lt Richard F. Cooney (A/C Commander). For extraordinary achievement while participating in aerial flight 25 May 1945. These individuals were combat crew members flying a B-29 based in the Marianas Islands on a low level, night incendiary attack made on important industrial facilities in the city of Tokyo, Japan. On the target approach, this plane was picked up and held by twenty searchlights, directing heavy intense flak. The left elevator and horizontal stabilizer of the tail assembly were almost demolished by hits; the two forward gun turrets, the mixture control on number two engine, eight minor control cables, and all radio equipment were shot out. The radio operator was wounded. The number three engine was hit and caught fire. In spite of this, the burning engine was not feathered because of the need for all available power and the attack was pressed home and the bombs released on the briefed aiming point, contributing materially to the burning out of more than twenty-two square miles of the city of Tokyo. Overcoming the grave difficulties brought about by the damage to the airplane, they returned over the 1200 miles of open water with one engine out and one crippled. The determination, courage and teamwork displayed by this crew, veterans of repeated assaults against the Japanese homeland reflect great credit on themselves and the Army Air Forces. This crew flew "Irish Lullaby".